Mega Sale! Free Shipping Included! 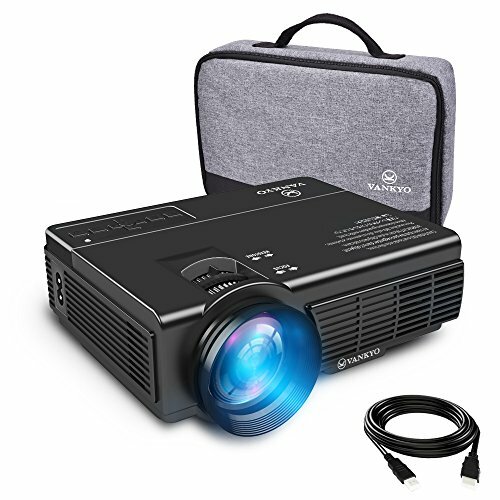 Save 26% on the VANKYO LEISURE 3 (Upgraded Version) LED Portable Projector with Carrying Bag, Compatible with Fire TV Stick, PS4, XBOX, 170'' Display and 1080P Supported with Free HDMI Cable (2-Black) by vankyo at Home Entertainment Centers Online. MPN: Q5. Hurry! Limited time offer. Offer valid only while supplies last. SUPERIOR WATCHING EXPERIENCE: Leisure 3 Projector is Powered by MStar Advanced Color Engine. Supporting 1920x1080 resolution, 2000:1 contrast ration which is ideal for home entertainment. Not recommend for PPT or office presentation. MULTIMEDIA PORTABLE PROJECTOR: VANKYO Leisure 3 projectors is fit for playing videos, TV series, photos sharing, football matches etc. It can be easily connected with your smartphone, PS3, PS4, X-Box ONE or Wii to enjoy BIG games. A customized bag is designed for you to carry and store it easily. BIG SCREEN SIZE EXPERIENCE: It provides a watching size from 32" to 176" with the projection distance between 4.9ft to 16.4ft. A projection distance of about 6.5 ft is the recommended viewing distance. 3-YEAR WARRANTY (100% MONEY BACK GUARANTEE): We offer our customers a 3-year 100% Money Back Guarantee and professional customer service & technical support. Please feel free to contact our customer service if you have any problems. If you have any questions about this product by vankyo, contact us by completing and submitting the form below. If you are looking for a specif part number, please include it with your message.